According to MarketsandMarkets the global Big Data market will reach $46.34 billion by 2018. 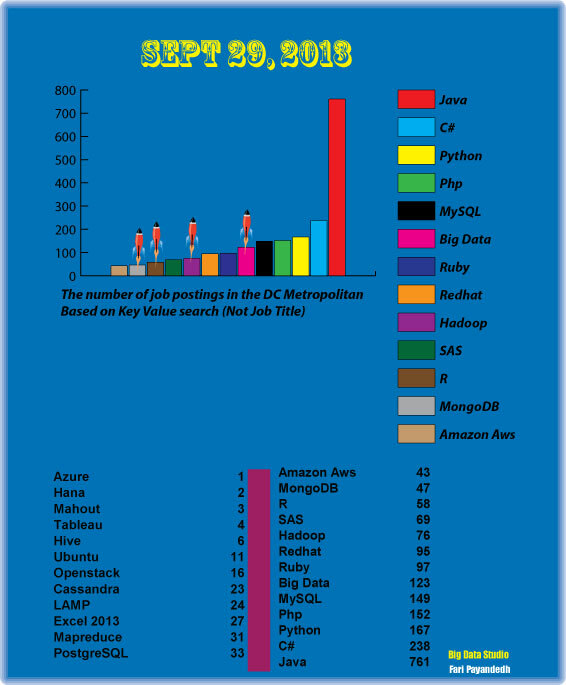 I wanted to check the local DC Metropolitan job market to verify the hype related to the shortage of professionals with Big Data skills. I went on a job board and searched for the number of job postings that listed Big Data tools as part of the requirements. I compared the numbers with the numbers that I had recorded on September of 2012. The broader IT market didn't change much in the past year, but there is significant growth in the Big Data related tools (Hadoop, R, MongoDB). I didn't record the number of postings for Data Scientists last year, but the number stands at 29 this year-- some are posted under Data Analyst because Big Data is new and some folks don't know the difference between the two; the only way we would know is to read the job description. One interesting fact pertaining to the geographic spread of the Big Data jobs; the jobs are concentrated in few areas. Below is the ranking according to Dice. The sorting was based on Per Capita Ratio. Big Data will create jobs in three areas: Data Infrastructure, Data Management, and Data Presentation (visualization). Large data sets need storage, Database software to store the data, and Analytics tools to turn data into meaningful information for businesses. Additionally, there are other parts of IT that will be impacted by the surge of Big Data adoption such as Network, Security, and the Cloud. I divide the required skill sets into two categories: Immediate opportunities and long term opportunities. If you are interested to build your Big Data hot skills for today's market, you might want to take into consideration this list: Java, Hadoop, Linux, C#, R, Python, Php, Hbase, Cassandra, MongoDB, Amazon ERM, and Mapreduce. Planning your career for long term engagement will involve several other tools that might be very much in demand in a couple of years. Windows Azure, IBM PureData, Oracle Big Data Appliance, HPCC, Cloud Foundry, Pivotal, Sap HANA, Google BigQuery, OpenStack, Mahout, SAS, Excel 2013, Tableau, Ruby, postgreSQL, MariaDB, Pentaho, MySql, Jaspersoft, Talend, and LAMP. Software Defined Networking, Software Defined Storage, and Cloud Security are among the promising fields in support of Big Data in the coming years. Is, geographic spread of the Big Data jobs still same or any changes? The number one mistake an analytics hiring manager can make is to hire for skills. As a job seeker, highlight your insatiable curiosity and problem solving ability - this is far more valuable than the skills you have. Thank you so much! I was shocked myself after posting the article on my website. The site's hits went through the roof. It made me very happy and made me feel appreciated. But, above all else it was a confirmation that I can help especially the younger generation carve out a path for themselves in finding opportunities. I got my first job after I graduated due to the kindness of a stranger. I am forever indebted to her. "An act of kindness goes a long way". That is so true. Someday you'll be instrumental in helping others.